The parameters were the sloping site, the choice of brick as an exterior material, the glazing system of anodized bronze aluminum, the three-story height limitation on campus elevation and the rigid programmatic and budget requirements of the New York State Dormitory Authority. The residential complex houses 800 students, faculty advisors and a faculty master. The dining facility can provide food service for the residential complex as well as for commuter students. Academic and student activity areas are integrated into both facilities. 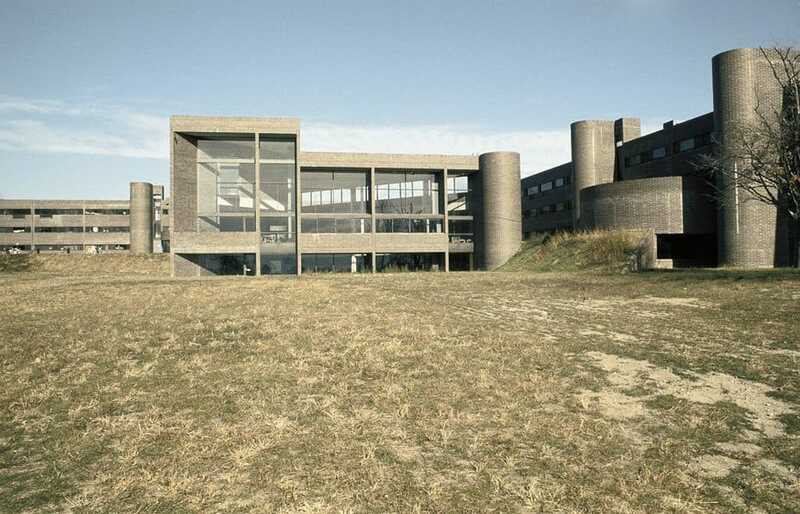 The U-shaped building complex encloses a major outdoor space which is open-ended to the south, providing a transition between the natural environment of the meadow and the formal discipline of the campus plan. The two main gateways to the complex are from the commuter student parking lot and from the south end of the academic campus. The entry elevation is a berm, one level above natural grade, which makes it possible for the building to step down a full floor as the grade lowers, and for the horizontal roof height to remain constant while the building changes from three to four stories. The berm also allows for the major existing trees to be retained. The dormitory organizes student accommodations into eight groups, with four main entrance points off the berm elevation which houses the lobby, a seminar room and a common room. Each floor unit of 20 includes several types of rooms: four, six and eight person suites, corridor doubles and singles and a public floor lounge. Circulation on each level is restricted to the zone between stairs and entry points. A continuous enclosed horizontal corridor is provided at the lower level to facilitate service and to allow indoor circulation throughout the complex during inclement weather. The dining facility is entered from the berm walk and is serviced on the lower level. Student activity spaces occupy the entrance level and second floor and surround the upper portion of the main dining space. Food is served on the lower level, which opens out to the meadow. Dining spaces can accommodate 15, 50, 100 and 200 persons.